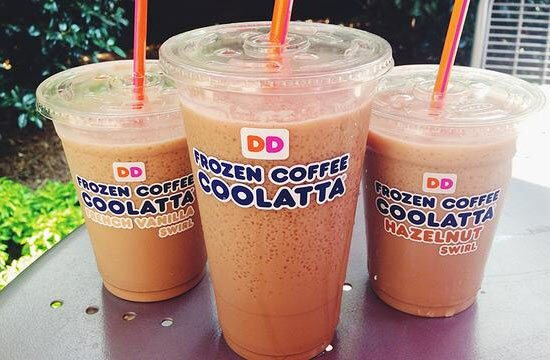 With Dunkin' Donuts removing the Coffee Coolatta from their menu after many years , we thought it was time to show you how to make it at home so you can still get your Coolatta Caffeine fix! Top tip - You can use regular ice cubes, however it's best if you freeze some coffee into ice cubes the night before you want to make the Coolatta. Start by freezing down your coffee into iced cubes the night before. If you don’t have the time or fancy a Coolatta within the next 5 minutes then you can always use regular iced cubes! Once you’ve got your iced cubes (coffee or regular) put them into a blender. Pour the cup of coffee into the blender along with the sugar. Next add the whole milk or light cream and blend for approx 2 minutes until you get a slushy mixture. Pour the Coffee mixture into a tall glass and top with Whipped Cream.